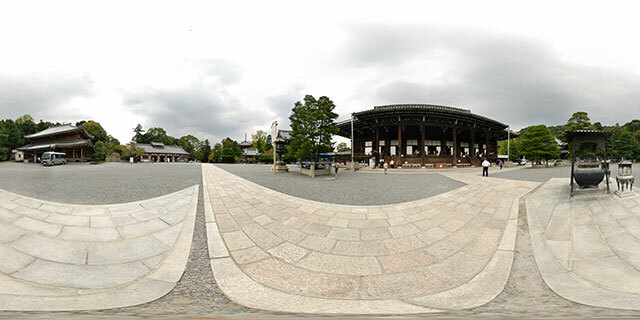 360° VR panorama of Kōfuku-ji (興福寺) temple in Nara, Japan. It is one of the eight Historic Monuments of Ancient Nara, which is listed on the UNESCO World Heritage List. It is also the headquarters of the Hossō school of Buddhism. 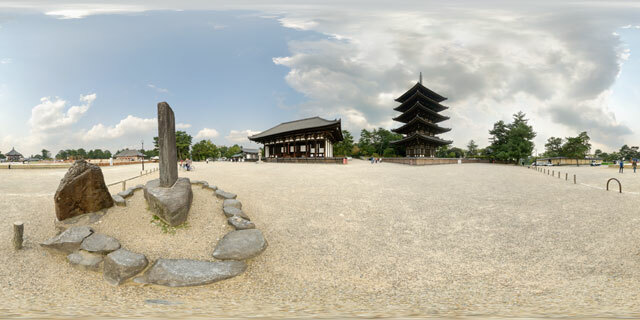 In this panorama you can see the East Golden Hall (東金堂; Tōkon-dō) built in 1425. Just to the south of the hall is the Five-storied pagoda (五重塔; gojū-no-tō), which was built in 1426 and is listed as a National Treasure of Japan. To the west is a large area where the Central Golden Hall (東金堂; Chūkon-dō) is being reconstructed. The temple was originally founded in 669 by the wife of Fujiwara no Kamatari, in Kyoto (at the time called Yamashina). It was then moved to Fujiwara-kyō in 672 and moved again to its present location in 710. Since then the buildings have been destroyed by fire and rebuilt many times. However, not all of the important buildings have been reconstructed. Of the three golden halls there is only one currently rebuilt, while another is still under construction. The nandaimon, chūmon, and corridor have not been reconstructed, and are currently missing from the temple. 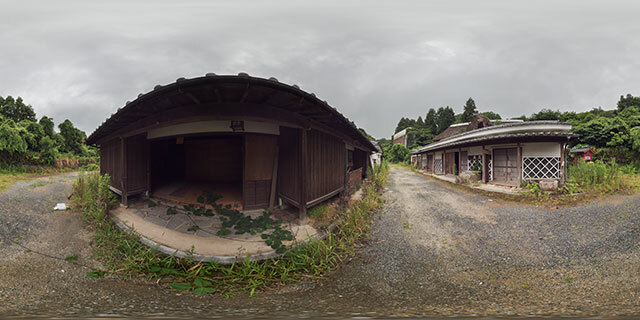 360° VR panorama of a street in Nara, Japan. Nearby is a building used as offices for Nippon Telegraph and Telephone West (NTT 西日本), while on the opposite side of the street is Jōkyōji (浄教寺) temple. Looking east along the street, Mount Wakakusa can be seen in the distance. 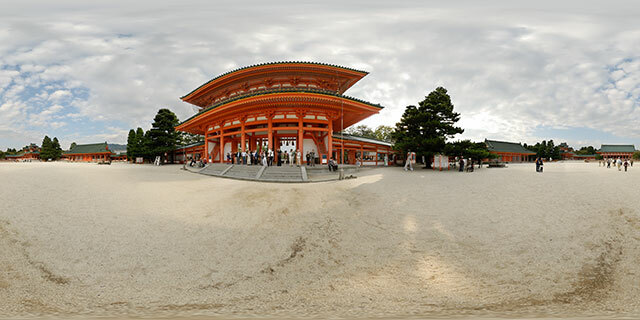 360° VR panorama inside Heian Shrine (平安神宮; Heian-jingū) in the Sakyo-ku ward of Kyoto, Japan. Heian Shrine was originally built in 1895, as a partial replica of the Heian Palace to celebrate the 1100th anniversary of the founding of Heian-kyō. The shrine is registered as an important cultural property of Japan. In 1976 some of the shrine buildings were burnt down, but these have since been rebuilt. 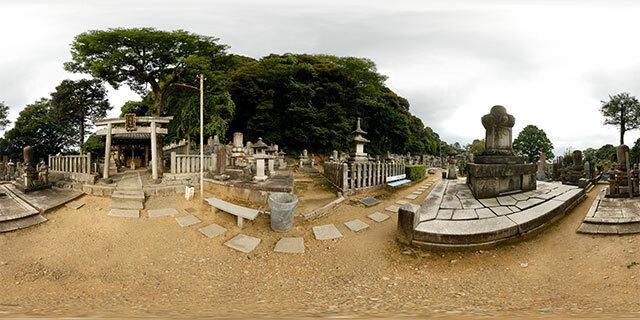 360° VR panorama of the northern end of the top graveyard at Chion-in (知恩院) temple, in Kyoto, Japan. The temple is built on Higashi-yama (East mountain). In this image you can see the Nuregami shrine (濡髪大明神; Nuregami Daimyojin), and the large grave of Lady Sen (千姫; Senhime). Chion-in is the headquarters of the Jōdo-shū (Pure Land Sect) of Japanese Buddhism, which was founded by Hōnen. Genchi, Hōnen’s disciple, founded the temple in 1234 in memory of his master. Many of the temple buildings were burnt down in 1633, and were subsequently rebuilt with help from the shogun Tokugawa Iemitsu. 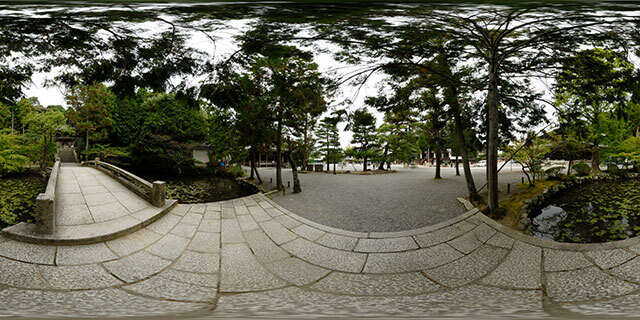 360° VR panorama of the area in front of Seishi Hall at Chion-in (知恩院) temple, in Kyoto, Japan. The temple is built on Higashi-yama (East mountain). Seishi Hall (勢至堂; Seishidō) is the oldest building in Chion-in, rebuilt in 1530. It is named after the bodhisattva Seishi. Seishi is said to be the original form of Hōnen, so the hall is also known by the name Honjidō (本地堂), which means Hall of the Original Form. 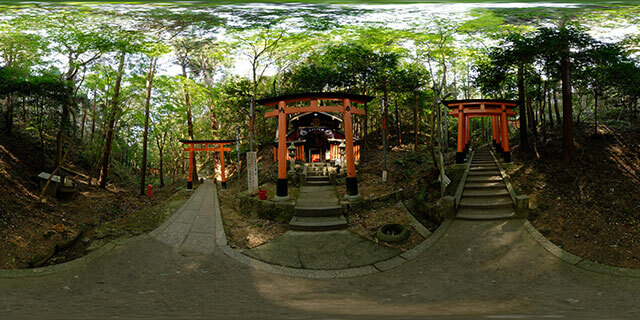 360° VR panorama of a bridge over a lily pond at Chion-in (知恩院) temple, in Kyoto, Japan. The bridge leads to a columbarium (納骨堂; Nōkotsu-dō). 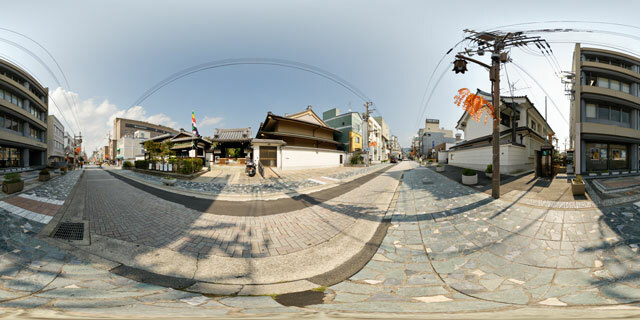 360° VR panorama of Chion-in (知恩院) temple, in Kyoto, Japan. Chion-in is the headquarters of the Jōdo-shū (Pure Land Sect) of Japanese Buddhism, which was founded by Hōnen. Genchi, Hōnen’s disciple, founded the temple in 1234 in memory of his master. Many of the temple buildings were burnt down in 1633, and were subsequently rebuilt with help from the shogun Tokugawa Iemitsu. 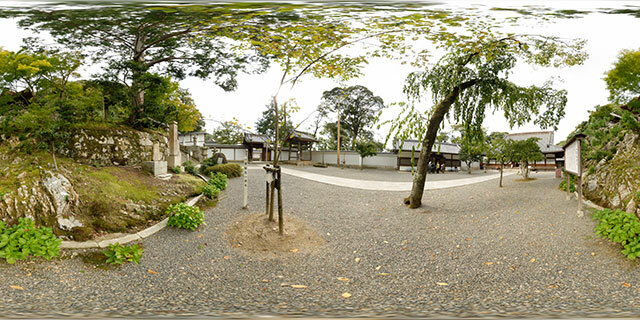 In this panorama you can see the main hall Mieido (御影堂), which was rebuilt in 1639 and is a National Treasure of Japan. The hall holds the sacred image (miei) of Hōnen. To the south-east is the Hobutsuden (寶佛殿), and to the south-west is the Taihei pavilion tea shop (お茶処泰平亭). Nearby is a large censer used for burning incense. 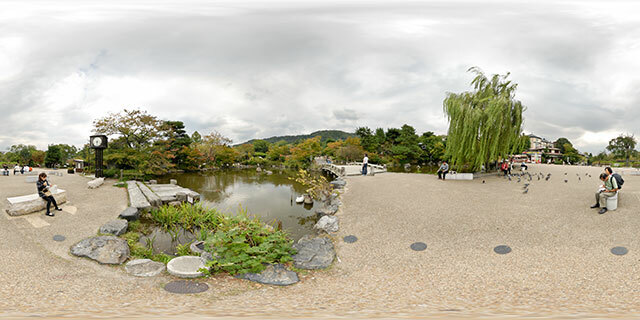 360° VR panorama of the pond at Maruyama Park, in Kyoto, Japan. Maruyama Park (円山公園; Maruyama kōen) is famous for its cherry blossoms in Spring, and is a nationally-designated Place of Scenic Beauty. It is located near the Chion-in temple and Yasaka shrine, in the Higashiyama-ku district in the south of Kyoto.